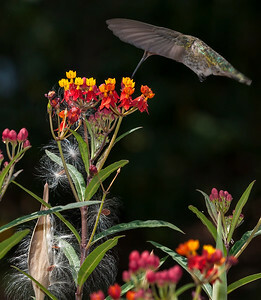 Our two Milkweed plants received constant attention from Hummingbirds and Monarch Butterflies. 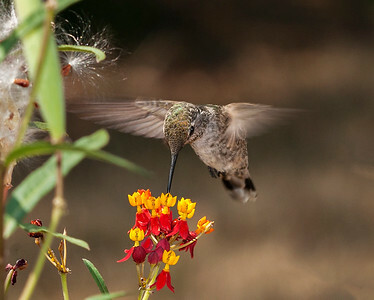 An Anna's Hummingbird feeding at the Milkweed blossoms. 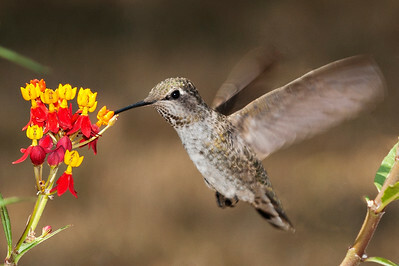 Notice the fascinating feather pattern on the Hummingbird's head. 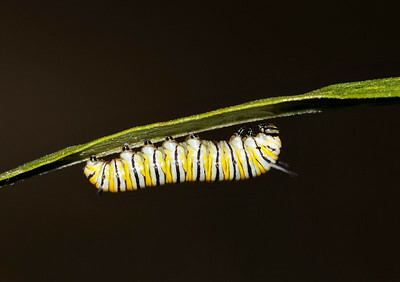 A few weeks after visitation by a Monarch Butterfly, caterpillars appeared. We would count up to 15 caterpillars at a time. 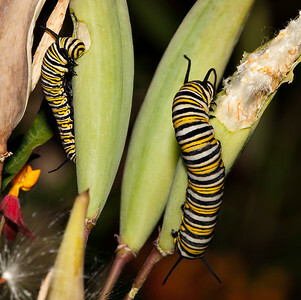 They set about devouring the Milkweed plants. 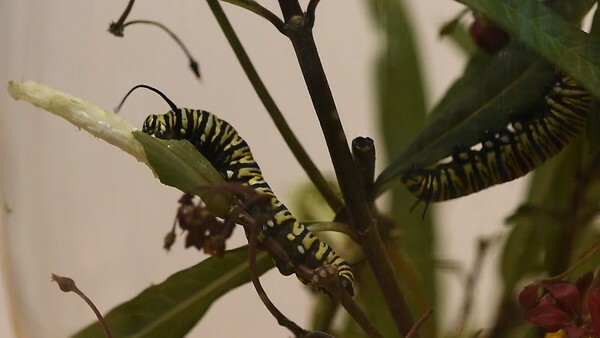 The caterpillars are symmetric. It is difficult to tell head from tail. In this photo, head is on the right. They typically hide hanging upside-down underneath leaves during the day, out of sight of many predators. 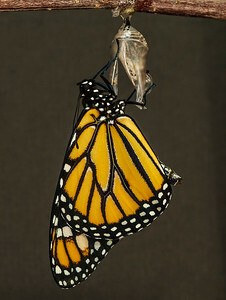 This guy is about to form its chrysalis by attaching at the tail and dropping into a vertical posture. 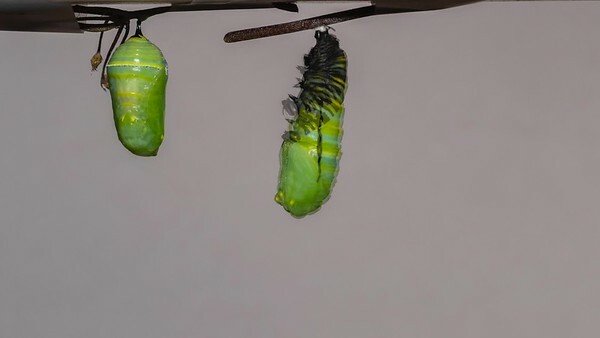 After feeding for up to two weeks, the caterpillar goes off and forms a chrysalis where it will transform into a Monarch butterfly. 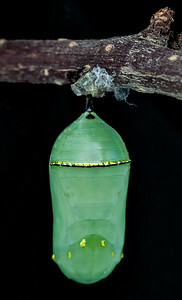 The chrysalis have beautiful gold beading and interesting formation lines. They are jade green in color. 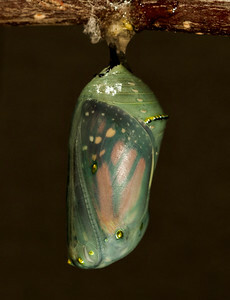 On about the 12th day, the chrysalis becomes transluscent and you begin to see the Monarch forming within. 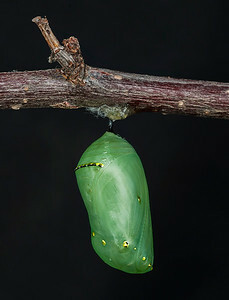 At this point the butterfly is within 24 hours of emerging into the open. This is our first Monarch from this year's batch. I was astonished at its size and beauty. 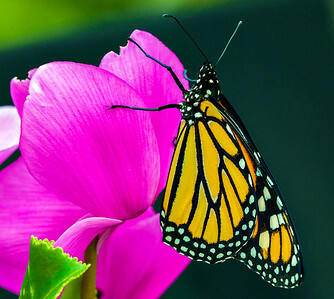 Mother nature did an amazing job of packing him into that small space and transforming the caterpillar into this beautiful winged creature. 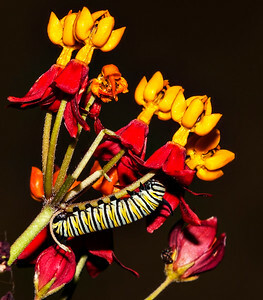 He is now off to enjoy life and hopefully produce more Monarchs for our yard and the Bay Area. Giovanni is on the left; Maria on the right. Note the fancy footwork as she backs down a leaf. Giovanni is eating a seed pod; Maria a leaf.